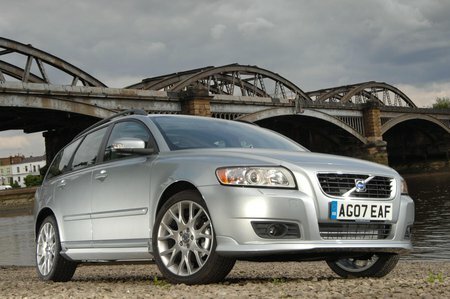 Used Volvo V50 Review - 2004-2012 | What Car? What's the used Volvo V50 estate like? The Volvo V50 is both exactly what you’d expect, yet also refreshingly different. 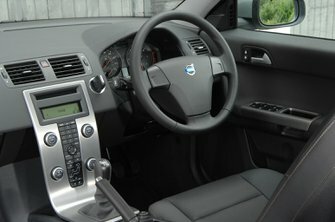 Being a Volvo, it has excellent safety credentials including the same whiplash and side impact protection systems as larger Volvos of its time, and it feels very well built. Yet, compared with previous Volvo estates, the V50 is notably handsome and, most shockingly of all, relatively small on the inside. Boot space is tighter than you’ll find in any of its rivals, particularly because the wheel arches intrude enough to make it quite narrow. On the plus side, the V50 can still hold a folded baby buggy with plenty of room to spare, while the flat loading lip and split-folding rear seats are a help when it comes to loading heavier items. Plus, being able to fold the front passenger seat flat might just come in useful for getting that flatpack bookcase home. Passenger space is a little tight for those in the rear, so while kids will be fine, taller adults are likely to wish for more head and leg room. No such complaints for those in the front, and with plenty of adjustment in the driving position and excellent seats, it should be possible for drivers of all shapes and sizes to get comfortable. As with rivals such as the Audi A4 Avant and BMW 3 Series Touring, the V50 is based on a saloon (the S40), but unlike those cars it has underpinnings that can be traced back to the Ford Focus. However, on the move the V50 majors on comfort and stability, dialling out some of the Ford’s fun-to-drive character. The ride is a touch firm on Sport, R Design and Drive-E models, but other V50s are more relaxing, and low noise levels makes it a good car for long journeys. In the V50's lifetime, its engine range included 1.6, 2.0 and 2.4-litre diesels, plus petrol engines ranging from 1.6 to 2.5 litres, the latter of which was sold in top-spec T5 trim with the option of four-wheel drive. A facelift in mid-2007 resulted in sharper styling (particularly in R-Design trim), an improved in-car entertainment system and the option of a manual gearbox for the D5 diesel engine. Further changes in 2010 resulted in the 2.0-litre four-cylinder diesel engine being replaced by Volvo’s five-cylinder unit of the same capacity, now known as the D3 or D4 depending on power output. At the same time, a new 1.6-litre diesel became the D2, and the 2.4-litre T5 and D5 engines were discontinued.